Reflective cases and straps help to increase emergency worker visibility on the roadside or in any situation where low level ambient light could make it difficult to distinguish a person from the background objects and road. By adding reflective elements to a uniform, drivers and other emergency workers can quickly identify the location of the worker and their movement in the emergency area. RadioTech’s™ two-way radio reflective straps help to identify an emergency worker by adding more than 35 inches of reflective material to their uniform. Our reflective cases help in locating a radio in a dark or lowlight situation by highlighting the base of the case where the radio sits. In 2005, the two-way radio accessory industry began promoting new reflective products to help increase the visibility of firefighters working in nighttime and low light situations. As with any new industry development, it took time for the availability of top quality materials. 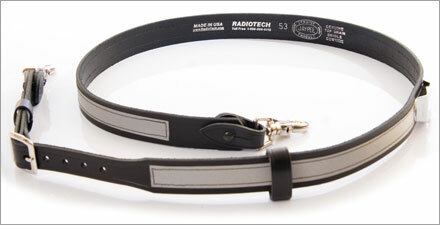 At RadioTech™, we determined that emergency workers who did not need to wear turnout gear should have the protection of the finest quality reflective surfaces on their straps and cases, but not until we could be assured of the integrity of the reflective surface quality and its ability to adhere to our top quality leather products. We did our homework, including research and product testing. In 2008, we introduced our first reflective products that use 3M Scotchlite Silver Reflective Tape. This tape, which meets or exceeds NFPA – 1971-2000 standards, is glued and then stitched with 5 cord high quality nylon lockstitching to assure premium adhesion to our cases and straps. Today, you can continue to enjoy the quality and durability that you have come to expect from the RadioTech brand in RadioTech High Visibility Reflective Original Products. At RadioTech™ we firmly believe that a radio strap should be worn in its original fashion under a firefighter’s turnout coat, where it is least able to become entangled during a fire or emergency situation. There are occasions, however, where firefighters, EMTs and other emergency workers who use RadioTech straps and cases may not be wearing turnout gear. In these cases, especially when these people may be outside in low light or nighttime conditions, reflective cases and straps can help enhance their visibility to drivers and others on the road. For this reason we offer all of our standard and custom design cases and straps with reflective options and suggest that any emergency worker who may work during these conditions help improve their safety by using reflective products and gear.